UMI Performance 93-02 Camaro Firebird K-Member SBC/BBC Motor Mounts RED 2322. Application: 1993 - 2002 Chevrolet Camaro 1993 - 2002 Pontiac Firebird. The UMI tubular K-member features integrated polyurethane mount mounts and fabricated mounting clam shells for maximum weight savings and installation ease. 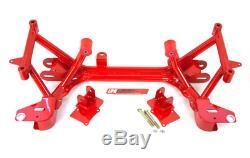 K-member includes power steering rack mounts and is a direct bolt in application. Note: Although this K-member allows easy installation of a small block or big block Chevrolet engine modifications to firewall and other areas may be necessary for proper engine clearance. Build Features: - Main center tube constructed of 1.500 x 0.120 DOM seamless steel tubing - Additional cross braces use 1.250 x 0.120 DOM seamless steel tubing - Entire K-Member features both TIG & MIG welded construction for superior strength - Front & rear A-Arm mounts CNC machined & fabricated from 0.188" thick steel - Rear A-Arm mounts gusseted to with-stand extreme side loads & pressure - Dual tube center section adds increased strength over any competitors design - All mounting plates are CNC machined to insure hole to hole accuracy - Factory locator pins included for easy installation & exact fit - Completely fixture welded to insure factory fitment with no grinding or cutting - Standard power steering rack mounts included - Durable powder coat finish, available bright red or gloss black K-Member Benefits: - Automatically reduces 25lbs of front end weight - Offers additional clearance for headers & turbo piping - A-Arm slots lengthened a 1/2" over factory for additional adjustment - Rear main cross tube lowered for oil pan protection & coverage - Uses integrated motor mounts for maximum weight reduction. The item "UMI Performance 93-02 Camaro Firebird K-Member SBC/BBC Motor Mounts RED 2322" is in sale since Wednesday, April 18, 2018. This item is in the category "eBay Motors\Parts & Accessories\Car & Truck Parts\Suspension & Steering\Other". The seller is "hawksmotorsports" and is located in Easley, South Carolina. This item can be shipped to United States, Canada.